Once, Muruganaar when in the presence of Bhagavan Ramana, put forth a bunch of questions to Bhagavan. ‘How come I have so many doubts’, asked Muruganaar. Bhagavan replied that it was common to have doubts even if one is in the abode of the Sadguru and that is because of the fact that one has not reached the point of complete surrender. In this context, Bhagavan Ramana narrates the story of Sanatkumaras. This is slightly different from the one we find in Srimad Bhagavatam, but nevertheless, conveys the idea very well. ‘Once Sanatkumaras had numerous doubts which they wanted to get clarified. Firstly they reached Vaikunta, the abode of Vishnu. Seeing Vishnu along with His divine consort Lakshmi, they felt that being a householder, Vishnu would not be the right person to answer their questions. So they moved on and decided to meet Lord Shiva to pose their questions. Knowing beforehand that the Kumaras would turn Him down if he was with Goddess Parvati, Shiva took the form of a young man and penance under a banyan tree. The Kumaras approached Dakshinamurthy and decided to stay there until their doubts were cleared. They sat in front of Lord Dakshinamurthy and started firing their questions. Patient as he was, Lord Dakshinamurthy answered their questions one by one, and this went on for about a year. Although time passed by, there was no sign of cessation of doubts and questions. Sanatkumaras kept volleying their doubts. 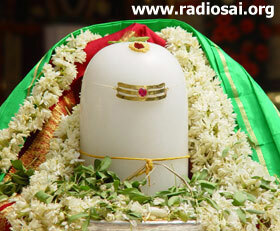 A year passed and Lord Shiva decided, ‘There is not going to be an end for this. Let me go into meditation.’. Thinking so, He went into deep meditation and enquiry. This very dynamic silence created peace and bliss in the Sanatkumaras.! Re: Not in the puranaas but this is what happened! Yes. It is true. Bhagavan Ramana has said this. Siva asked Parvati to go away for a while. You are in part a woman, Salutations to You! Yesterday, night i was just remembering Sri Bhagavan along with Sri Sheshadri Swamigal.... for some strange reason, it just occured or flashed to me that Sheshadri Swamigal was Uma Devi, Unnamalai or Apitakuchalaambaal. She had come here, before her Parameshwara came. Sri Sheshadri Swamigal was a highest order Sri Vidya Upasaka, Sri Vidya Upasakas are known to be the Shakti. Our beloved Sri Ramana is Shiva and Sri Sheshadri swamigal is Shakti.